Displays birds eye view of approach path to show aircraft's current position relative to the approach path/course. Displays 5 nm standard traffic pattern around selected runway. 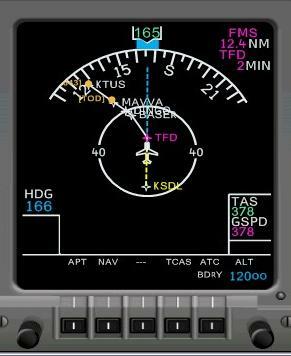 Floating TOD display adjust to aircrafts position relative to the calculated descent path to indicate if aircraft is above or below the deacent path at its current position. Displays nearby VOR's and NDB's and /or Airports when the Nav or APT function is turned on. These displays due to clutter will not display when the Nav display is set to the higher ranges. Displays nearby ARTCC/FIR Air traffic control boundaries. Popup TCAS view that displays on top of the lower half of the Navigation display. Can be toggled on/off as needed. Displays Airport runway configuration when Nav display zoom is set to 2.5nm or less. This display is set to the departure airport when a new flight plan is loaded and automatically set to the arrival airport when the aircraft leaves the departure airport area.